The Italian Wider 42 premiered at the Palm Beach International Boat Show. Wider is indeed a wider with its 42 feet maximum length that can be achieved with a press of a button. The mobile extensions are at both sides of the hull. This will double the deck area and will give the boat complete stability. Wider was conceptualized by Tilli Antoinelli, founder and president of Pershing Yachts. The Wider 42 and the Pershing Yacht company is based in Mi Monte Porzio, Italy. The Wider designs target the open-day cruisers. 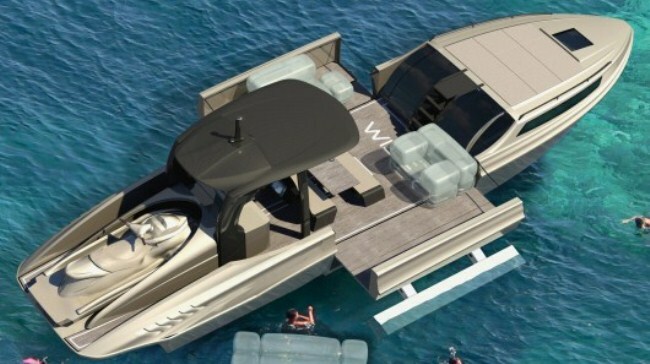 The company is presently planning to ramp up production for new yachts, both larger and smaller models of the Wider 42. Wider “aims to invent new formulas for travelling by sea, proposing bold, original solutions” and the new 42 footer, from well-known designer Fulvio De Simoni, is exactly that – an open yacht with automatic, patented and quite revolutionary system.